North Country Fiddle and Dance is a non-profit organization whose overriding mission is to build community by carrying forward our North American cultural heritage of traditional music and dance. This mission is implemented in the initiatives listed below. 1) The organization will provide a focal point for those interested in traditional music and dance, as well as for those looking for a meaningful and participatory recreational activity. 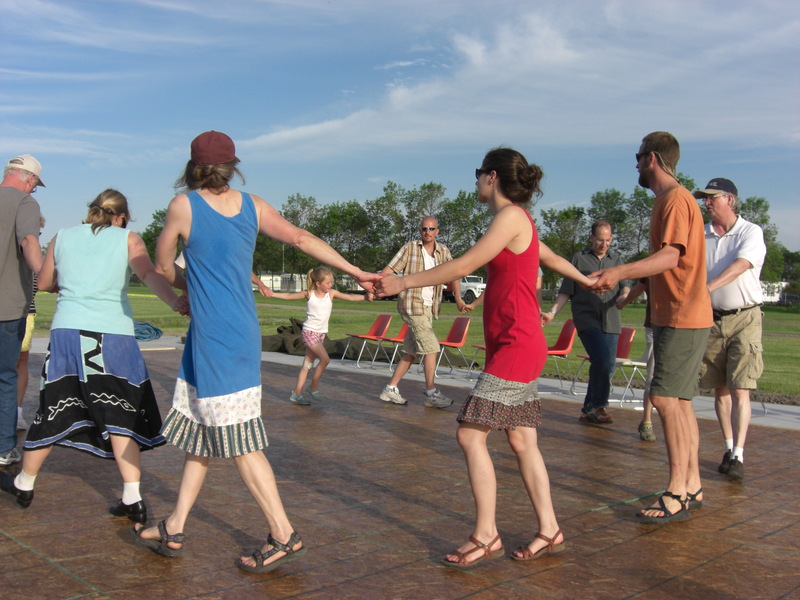 Toward this goal, the group holds several public community dances per year, where simple folk-dances including reels, squares, contras, and circle mixers are taught and no experience is necessary for participation. To make the dances affordable for all, there is no admission fee. Donations, however, are accepted at the door to help cover costs. 2) Members of the group, contingent upon their level of interest, may form ensembles of musicians and dancers to perform at various events around our region with the goal of preserving and promoting North American folk dance and music traditions. These activities raise awareness and educate people about the traditional cultures of the region. 3) North Country Fiddle and Dance will strive to form alliances with other existing or developing traditional music and dance organizations in the region that includes Minnesota, eastern North Dakota, southern Manitoba, Wisconsin, and Iowa. This is accomplished by cultural exchanges and joint activities that allow musicians, callers, and dancers to practice their art and learn from one another. North Country Fiddle and Dance (NCFD) was formed in 1986 by Jeanne and Tom O'Neil in East Grand Forks (EGF), MN. Since then, the group has been holding community dances, presenting concerts, and performing around the region. The original name of the group was "North Country Traditional Music and Dance Society". The name was shortened to "North Country Fiddle and Dance" in 1998. Since it was founded, the organization has been holding public community dances in the Greater Grand Forks area. In the early years the dances were held at various venues in Grand Forks and East Grand Forks, beginning at the Grand Forks Civic Auditorium near downtown (which was subsequently torn down). 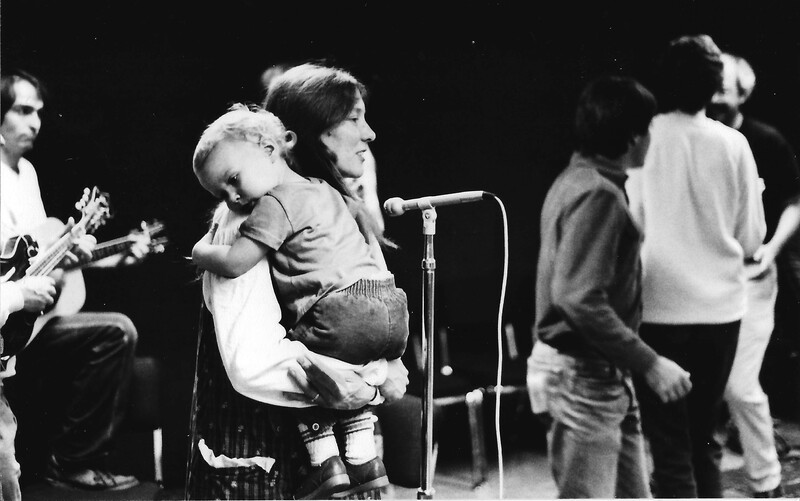 Other venues included the Josephine Cambell Recital Hall and the International Center on the University of North Dakota (UND) campus, the basement of St. Paul's Episcopal Church, the Grand Cities Mall Community Room, the Nancy Paisley Dance Studio, the North Dakota Ballet Studio, and the Senior Centers of both Grand Forks and East Grand Forks. Jeanne O'Neil was the regular caller, and the band was an informal group of local musicians that called itself the North Country String Band. The regular band members through the early years included Tom O'Neil (fiddle and guitar), Jeanne O'Neil (concertina), Mike Gregory (mandolin), Tom Lockney (guitar and banjo), Don Uhlenberg (guitar and banjo), Mark Bobmann (fiddle and mandolin), and Bruce Barton (guitar). In addition to the regular dances, the group held one or two special events per year that featured a performance by a visiting band or dance group. The visiting musicians would present a brief concert and then provide music for the dance, possibly joined by members of the North Country String Band. Many of the visiting musicians were from Canada, including Meadow Lark (1990), Parlour Tricks (1992, 1994), Hole in the Wall Band (1992), Nan and Martin Colledge (1996), Marty's Party (1997), and Whiskey Before Breakfast (1998) from Winnipeg; and On the Edge (1998, 1999) and Bill and Mariette Howatt (1995) from Manitou, Manitoba. In addition to the guest musicians, NCFD invited Ian Kirk, dancer and instructor with L'Ensemble Folklorique de la Rivière-Rouge from St. Boniface, to be the guest caller at a community dance in 1996. Several more special events are described in the section on concerts and collaborations below, and many of them were partially supported by small grants from local and regional arts organizations. The full list of grant-supported activities can be found by clicking Sponsors and Grants. 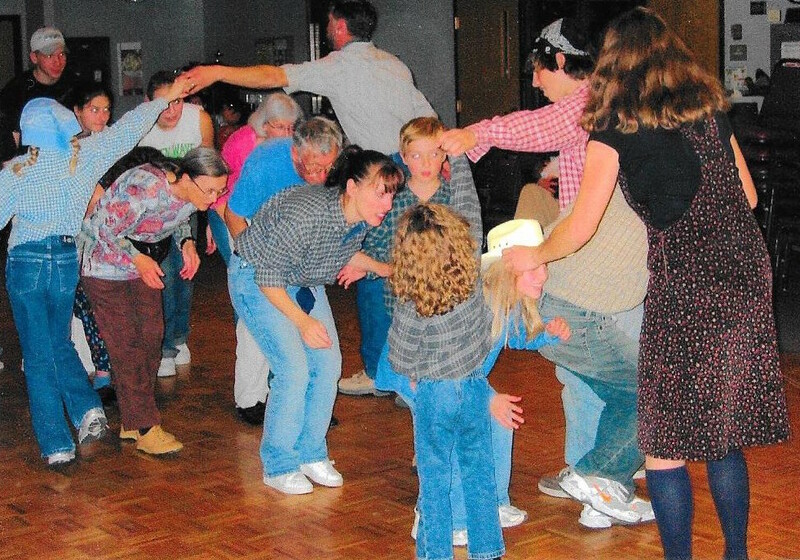 In the early 2000's, the group made an effort to stabilize the venue and format of the community dances. The regular dances had been held without a sound system, and at times the attendance was high enough to overwhelm the caller and band, and the venue was continually changing. The North Country String Band was difficult to maintain due to retirements, graduations, job changes, and evolution of musical interests of the band members. 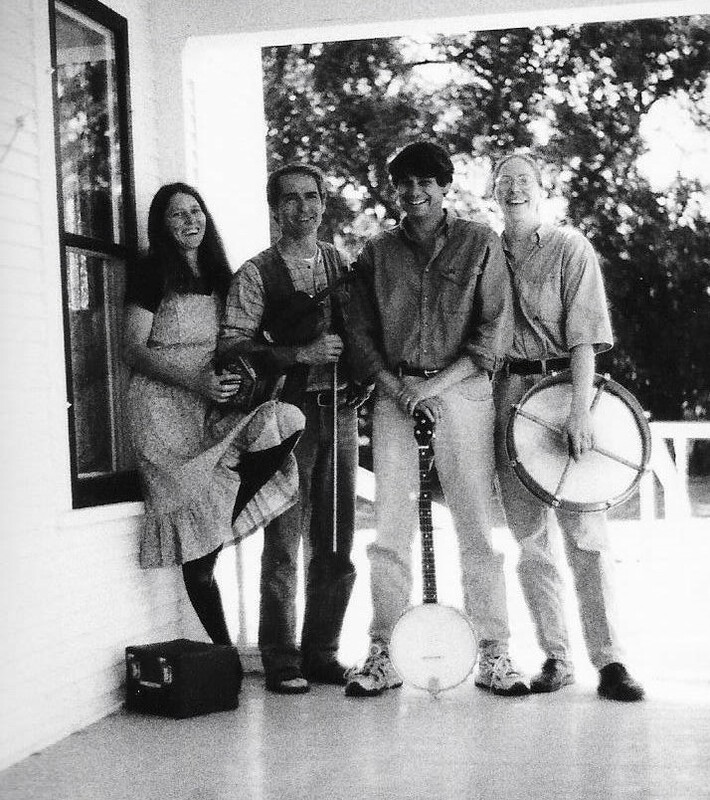 Bradin Frieder (banjo) and his wife Christina played with the string band for a few years (2000-2001) after the departure of Bruce Barton and Tom Lockney. When Bradin and Christina left the area due to a job change in 2001, Jeanne and Tom invested in some sound equipment, negotiated regular room rental with the Grand Forks Senior Center, and began to book visiting musicians and established dance bands from the region for the regular dances. Jeanne continued to be the regular caller while Tom managed the sound system and played in the band as needed. The featured bands included the Tickwoods from Fergus Falls, the Ogg Creek String Band from Fargo, the Porch Stompers from central Iowa, Four Mile Portage from Duluth, Paul Wilson and Mary Abendroth from Brainerd, and On the Edge from Manitou, Manitoba. We also booked individual musicians and pairs of musicians to join Tom in forming a band. These musicians included Doug and Betsy Wells from Fergus Falls (members of the Tickwoods), Bob and Gail Johnson from Fergus Falls, Mike Gregory and Gerri Dunnigan from Grand Forks, Bob Walser and Julie Young from Minneapolis, Paul and Susan Hammer from Winnipeg, Alyce Berube from St. Boniface, and Ken Natrass from Winnipeg. Tom and Jeanne's daughter Erin, who was in high school during this time, had become a proficient fiddler and performed with her parents as the O'Neil Family Band. So Tom, Erin, and Jeanne (if she was not calling) filled the role of house band when guest musicians were not available. Guest callers during these years included Terrence Smith from Duluth, Tom Maloney from Duluth, John Peterson from Fargo, Bob Walser, Julie Young, and Tim Jenkins from Gays Mills, WI. In about the year 2011, the managers of the Grand Forks Senior Center decided that it would no longer rent the facility to North Country Fiddle and Dance. So once again, we searched for a stable venue that was affordable. Jeanne wrote a grant proposal to the Northwest Minnesota Arts Council requesting partial funding for a year-long dance series. The proposal was successful, and we negotiated dates with the Eagles Club in East Grand Forks for our dances in the fall of 2011 and the spring of 2012. Since that time, Jeanne has written annual grant proposals to help pay the facility rent and the stipends for guest musicians and callers. Most of the dances have been at the Eagles Club, but we have also used the East Grand Forks Senior Center when the Eagles Club was not available. The format for the dances was unchanged, but the funding allowed us to bring in guest bands and callers more regularly. The Eagles hall also provided a larger space, large enough to accommodate a peak attendance of about 100 dancers in September 2012. In subsequent years, attendance declined from that peak to an expected size of 30 to 50 dancers -- a smaller group, but still ranging in age from kids to seniors, and always full of energy and enthusiasm. The data we gather for grant reports indicates that many of our dancers travel 50 to 100 miles to attend the dances. It also shows that each dance draws a significant number of newcomers. The guest musicians since 2011 have included most of those mentioned above, with the addition of Pig's Eye Landing from Minneapolis, Clancy Ward and Sarah York from Ashland, WI, Bill and Sarah Cagley from Minneapolis, the Bootlickers from Minneapolis, Adam Kiesling from Minneapolis, Mark Boggie from Duluth, Sharon Myron from Grand Forks, Mark Dixon from Fargo, Sean Fenstemaker from Grand Forks, the Corner Booth String Band from Fergus Falls, and the Liccks Stringband from the Duluth area. Guest callers have included Sarah York from Ashland, and Shawn Glidden, Robin Nelson, Rina Rossi, and Jim Brooks, all from Minneapolis. 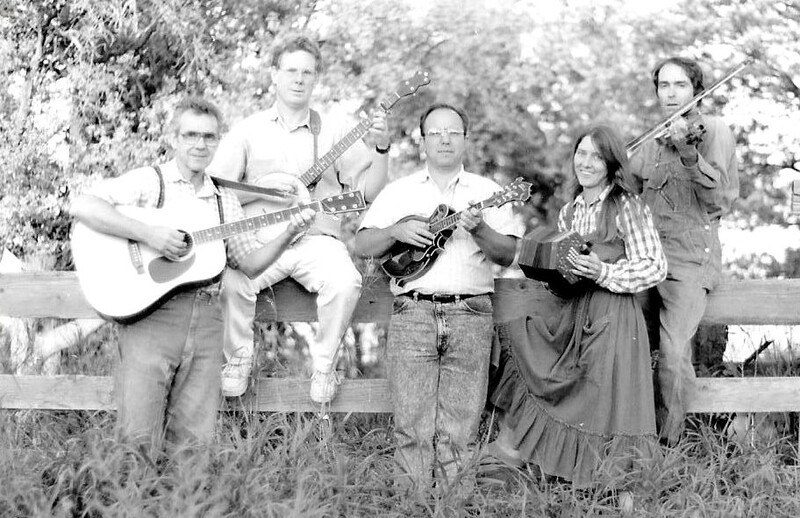 Drawing upon Jeanne and Tom O'Neil's performing experience with the Onion Creek Cloggers in Iowa from 1978-1986, the group formed a performance ensemble in its early years that featured old-time string band music by the North Country String Band and demonstrations of Appalachian clogging (a percussive dance done to Southern fiddle tunes). The dancers included Jeanne and Tom, Mark and Margit Bobmann, Janie Franz, and Sally Finzel. The group performed at various community events around the Grand Forks area, including Summerthing at University Park and the Winterthing and First Night celebrations in downtown Grand Forks. The members of the group donated their time for performances, and the proceeds were used to support the NCFD public dances. 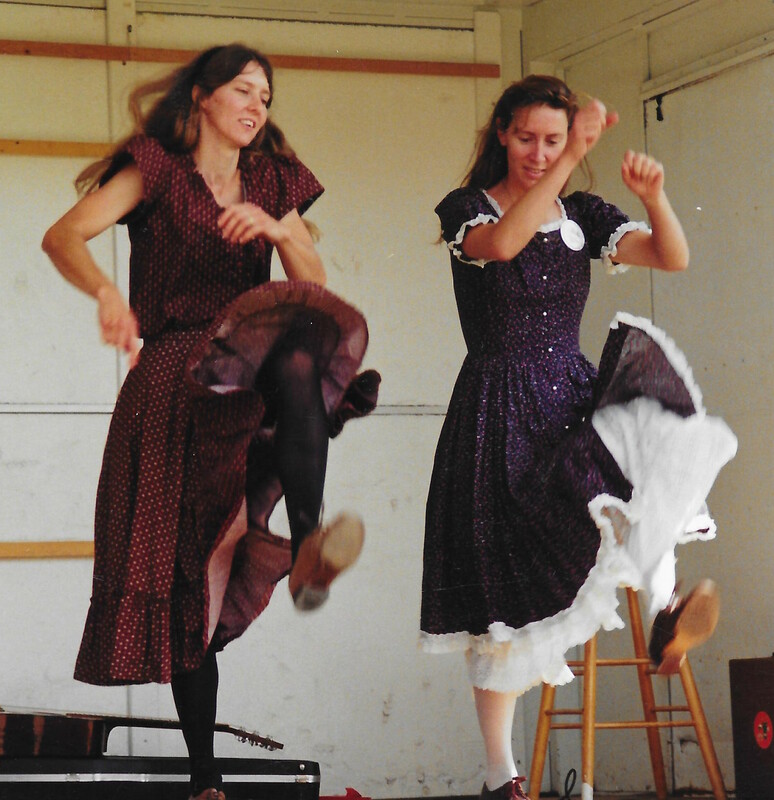 The clogging group stopped performing when the Bobmanns and Finzels left due to job changes, but Jeanne and Laura Schafer continued to provide clogging and French Canadian step dance demonstrations at North Country Fiddle and Dance performances in subsequent years. 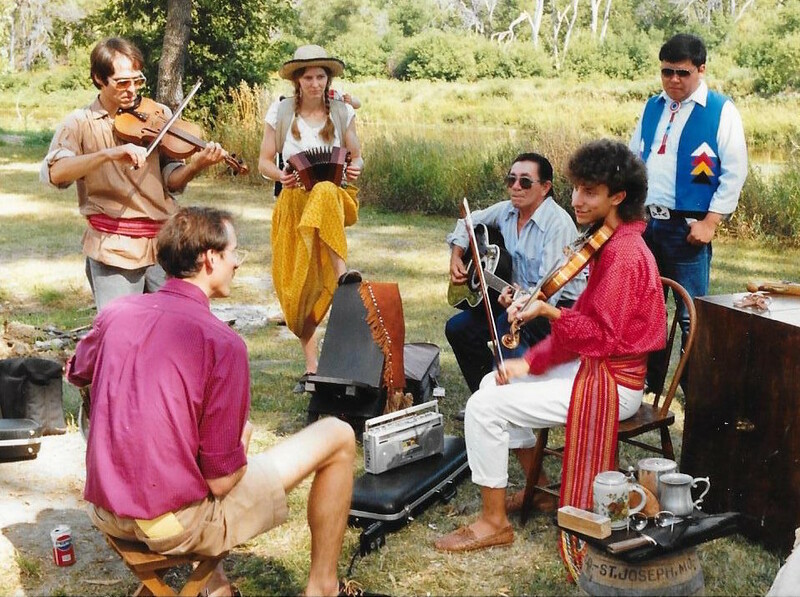 Throughout the early years of the organization, Jeanne and Tom encountered other groups and individuals that practiced traditions of music and dance of the Red River Valley that date back to the French voyageurs and the Métis fur trade era, and the North Country Fiddle and Dance repertoire was expanded to include tunes and dances from these traditions. The Winnipeg Folk Festival and Festival du Voyageur in Winnipeg proved to be valuable sources of regional culture. The O'Neils also learned some Métis tunes from Mike Keplin, a young fiddler from the Turtle Mountain area who was at that time taking classes at the University of North Dakota in Grand Forks. The group began to collaborate with L'Association des Français du Nord (AFRAN) in Red Lake Falls, MN, and L'Ensemble Folklorique de la Rivière-Rouge from St. Boniface, Manitoba. 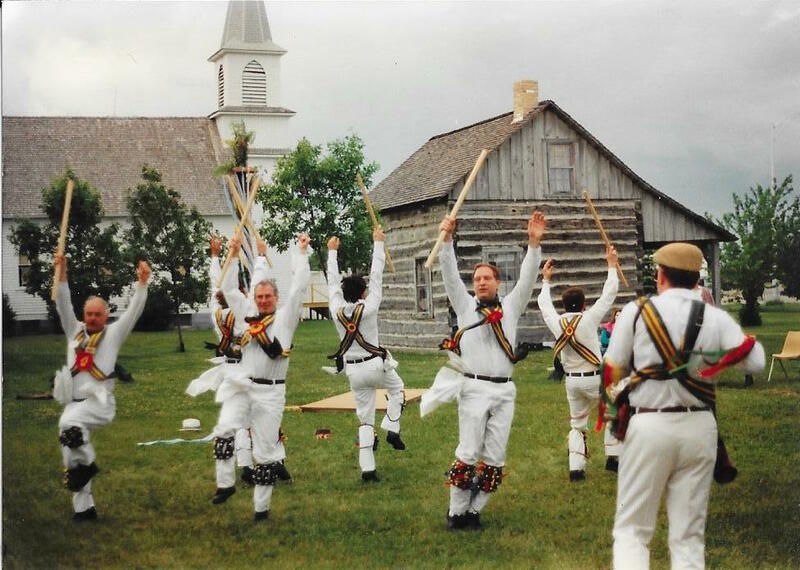 They also made connections with two other Winnipeg groups: the Village Green Morris Men, who carry on the tradition of English Morris dancing, and the Fine Companions, who practice and perform Engish country dance. 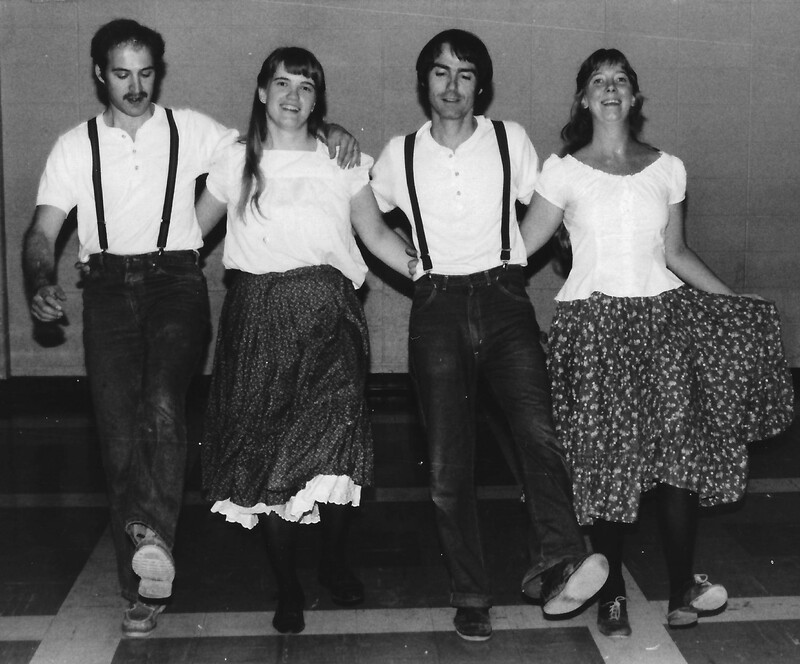 North Country's first grant-supported event was a performance and dance with Les Danseurs de la Rivière-Rouge from St. Boniface, Manitoba in 1988. The event was held at the old Civic Auditorium near downtown Grand Forks, with partial support from the Greater Grand Forks Arts and Humanities Association. In the following year, the organization received its first grant from the Northwest Regional Arts Council in Minnesota for a performance and dance workshop with the Wild Goose Chase Cloggers from Minneapolis. This event was held at the East Grand Forks Senior Center. 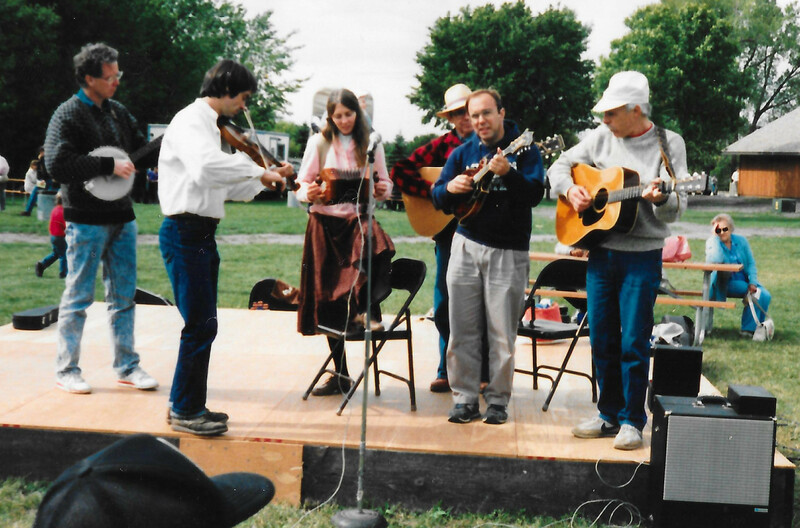 Beginning in 1989, North Country Fiddle and Dance collaborated with the East Grand Forks Heritage Foundation to organize a Traditional Music Show as part of the annual Heritage Days celebration at the East Grand Forks Heritage Village. The Traditional Music Show featured musicians and bands that performed traditional, folk, and ethnic music reflective of the region's cultural heritage. Over the years, the guest bands included numerous groups, mostly from Minnesota and Manitoba. The annual Sunday afternoon show ran from 1989 to 1998. On the Edge (Manitou, Manitoba), Wing and a Prayer (Manitou), Hole in the Wall Band (Winnipeg), Mike Keplin (Turtle Mountains), Fine Companions (Winnipeg), Bill Cagley (Minneapolis), Cross Roads (Manitoba), Slainte Mhah (Winnipeg), Royal Scottish Country Dance Society (Winnipeg Branch), Linda Breitag (Minneapolis), Prairie Dog Players (East Gand Forks), Wild Goose Chase Cloggers (Minneapolis), Girl Germs (Minneapolis), Brennan Leigh and Seth Hulbert (Moorhead, MN), The Beet Pickers (Fergus Falls area), Dan O'Neil (East Grand Forks), and the Village Green Morris Men (Winnipeg). In 1991 North Country Fiddle and Dance presented a Traditional Music Show as part of the Grand Forks Winterthing celebration. This event was co-sponsored with NCFD by the Grand Forks Park DIstrict and the Grand Forks Community Art Association. The event featured performances by Uff Da Mountain Boys (Fergus Falls Area), Lyne Lavigeuer and Alice Berube (Manitoba), North Country String Band, Friends and Neighbors (Fargo-Moorhead), and Dag Iverson (a UND student from Norway). 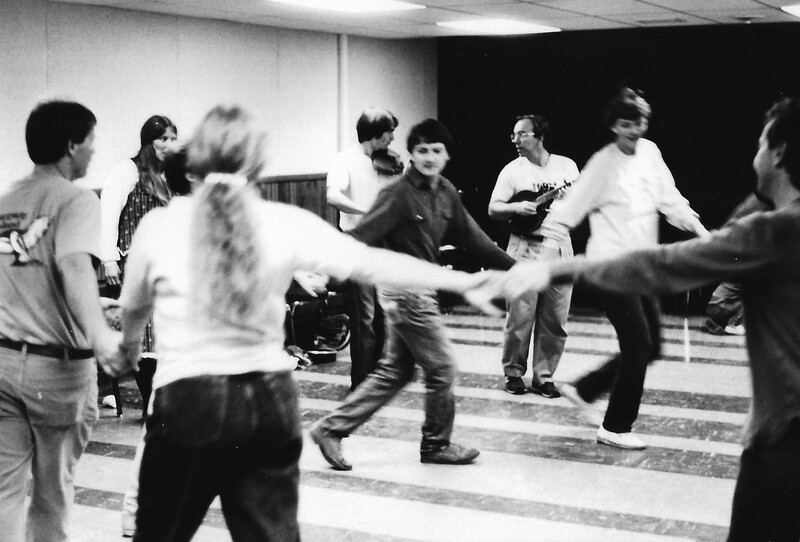 Other special events from the late 1980's through the 1990's included a concert and dance with Merle Hall, Rick Exner, and Roger Alexander from Central Iowa (1989); a performance and May pole dance by the Village Green Morris Men from Winnipeg at Turtle River State Park in North Dakota (1990); a concert and dance with the Greenwood Tree from Minneapolis (1995); a concert and dance with L'Ensemble Folklorique de la Rivière-Rouge from St. Boniface (1996); and a concert and dance with the Barn Owl Band from Central Iowa (1996). These events were partially funded by grants from the North Valley Arts Council in Grand Forks and the Northwest Regional Development Commission in Minnesota. The Greenwood Tree and L'Ensemble Folklorique events were held at the Performing Arts Center at Senior High School in East Grand Forks, and the Barn Owl Band performed at the Hughes Fine Arts Center on the UND campus. In addition to its regularly scheduled community dances, NCFD held weekly Saturday morning dance workshops at the Hughes Fine Arts Center and Chandler Hall on the UND campus from 1994 through 2005. 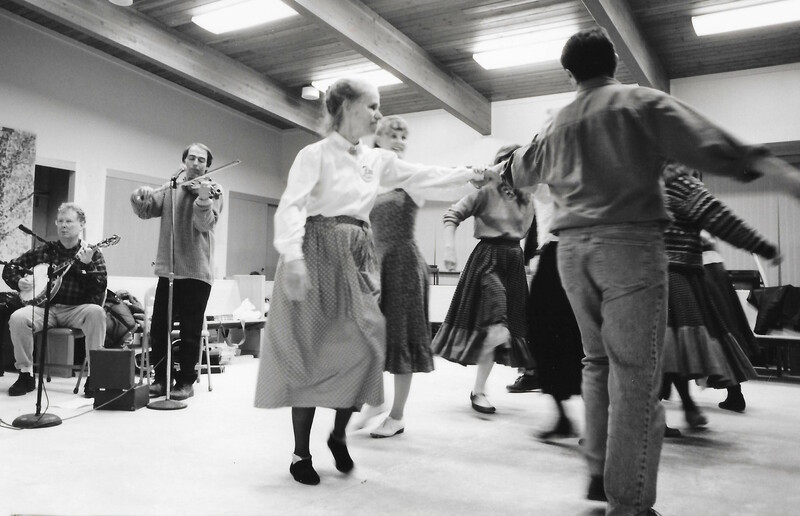 The workshops were intended for dancers with an interest in clogging or more complex contras and square dances. 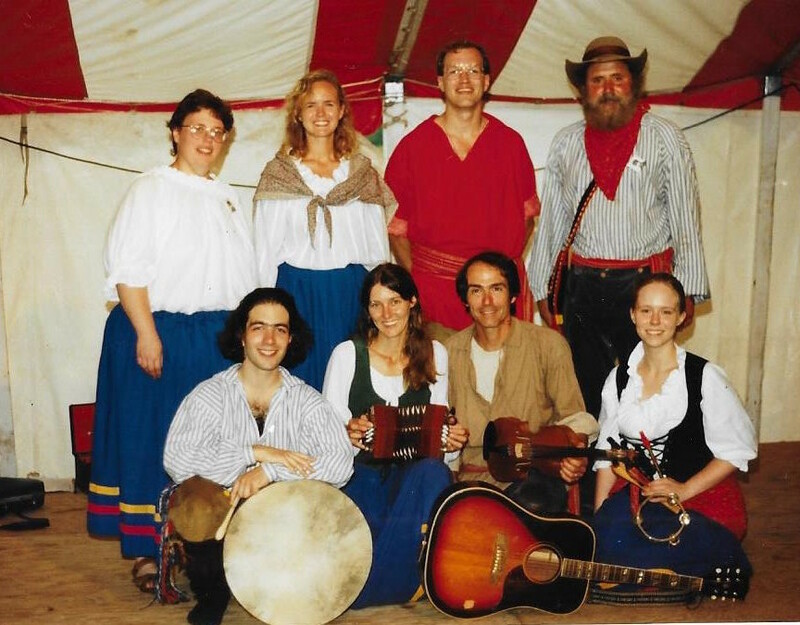 As an example of collaboration with another cultural organization, workshop participants Jeff and Ronica Brownson joined Jeanne and Tom O'Neil to learn period music and dance from 18th century France for a performance with AFRAN members at AFRAN's annual Chautauqua in 1995. We are grateful to Dr. Gary Towne, Professor of Music at UND, for helping us learn a minuet for this performance. NCFD continued to organize special events in Grand Forks and East Grand Forks throughout the 2000's with partial funding from regional arts organizations. 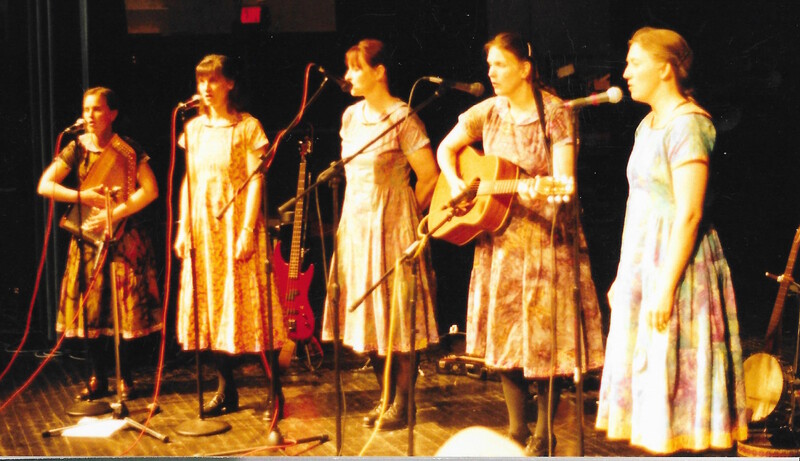 The Girl Germs from Minneapolis, featuring Appalachian-style clogging, old-time songs, and string band music, gave a performance at the East Grand Forks Performing Arts Center in 2004. This event was partially funded by grants from the Minnesota Northwest Regional Development Commission and the EGF Arts and Crafts Council. In 2008, the Porch Stompers string band from Iowa played for a concert and dance at the EGF Senior Center. They also presented a workshop for old-time fiddle and banjo at the Scott's Music studio in downtown Grand Forks. These events were partially funded by a grant from the North Valley Arts Council. Also in 2008, NCFD collaborated with AFRAN to hold a fiddler's workshop at AFRAN's annual Chautauqua at Huot Park in August. Guest fiddlers included Alyce Berube from St. Boniface, Chuck Butler from Duluth, and Shawn Glidden from Minneapolis. NCFD presented special concert/dance events at the EGF Eagles club featuring bands sponsored by the Minnesota Bluegrass and Old-time Music Association in 2009 and 2010. The Mill City Grinders, a string band from Minneapolis came in 2009, and Duck for the Oyster from Wisconsin, playing traditional music for contra and square dancing, visited in 2010. Also in 2009, NCFD hosted Paul Wilson and Mary Abendroth, sponsored by the Grand Forks Sons of Norway, for a community dance at the Grand Forks Senior Center. Paul and Mary perform traditional music and songs from Norway. NCFD's most ambitious project in 2009 was a full day outdoor Bluegrass and Traditional Music Fest at the East Grand Forks Heritage Village with an afternoon stage show, arts and craft activities for kids, a Maypole dance, and an outdoor traditional dance on a portable dance floor in the evening. The stage show featured the Woodpicks bluegrass band from Thief River Falls, the O'Neil Family Band, Four Mile Portage, the Tickwoods, Bruce Elseth and Paul Tandberg from Newfolden, the North River Ramblers from Grand Forks, and the Ogg Creek Stringband. In the fall of 2010, NCFD sponsored a concert entitled "A Grand Night for String Bands" at the Empire Arts Center in downtown Grand Forks. The concert featured the Far Shore String Band (Port Wing, WI), the North River Ramblers (Grand Forks), and Jeanne and Tom O'Neil. The event was partially funded by a grant from the North Valley Arts Council. After 2010, Jeanne began writing annual grant proposals to support the community dance series, bringing guest bands and musicians to play for the dances on a regular basis. The details can be found under Sponsors and Grants. We are grateful to all the callers and musicians who have shared their talents with us, as well as to the funding organizations that have made it possible to bring them to our community. We also appreciate the support of all who attend our events, and we hope to continue the tradition of happy music and joyous dancing in the years to come.